President Trump made a stunning announcement today, recognizing Israel’s sovereignty over the Golan Heights. The Golan is crucial for Israeli’s defense which is why Israel annexed the Golan Heights in 1981. But five U.S. Presidents didn’t have the courage to recognize that for her own security Israel could never give up the Golan Heights until President Trump. This is the third courageous pro-Israel move executed by Trump. He also recognized that Jerusalem was Israel’s capital relocating the U.S. embassy, and pulled out of the lousy Iran nuclear deal. 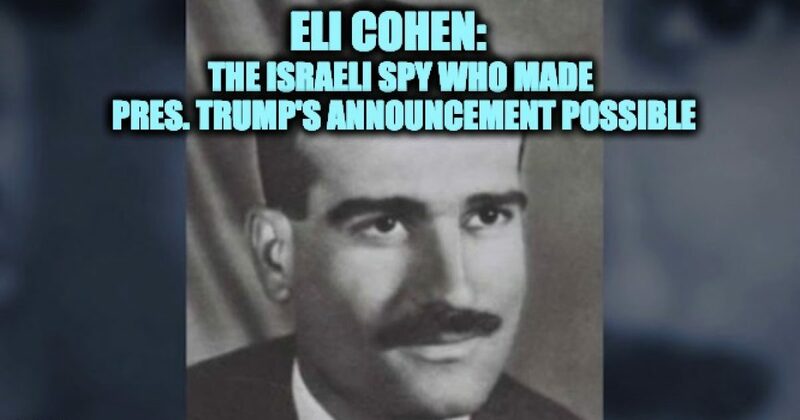 As we celebrate President Trump’s announcement we should also remember Eli Cohen, the Israeli spy whose courage helped Israel take the Golan Heights after being attacked by Syria during the Six-Day-War. Before the Six-Day-War, Syrian artillery steadily rained down on the Israeli farms and villages in the Galilee below, and its military was poised to use the high ground to attack Israel. By taking over the most strategically important areas of the Golan in June 1967, the Galilee was protected, and the IDF acquired an optimal line of defense to hold back a Syrian ground attack. With Iranian forces having free reign in Syria, Israeli sovereignty over the Golan is more critical for its basic security than ever before. Iran wants to create a land bridge across Israel and into the Mediterranean Sea. A fact that thankfully President Trump understands. Amazingly he made the announcement and foiled Iran’s plans on the Jewish holiday of Purim. 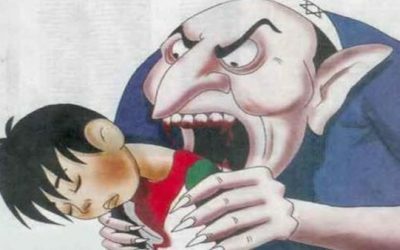 During Purim Jews across the world celebrate foiling the ancient Persians’ plot to destroy the Jewish people. Persia still exists today, it changed its name to Iran in 1935. In other words, President Trump helped to create another Purim miracle. Chazak Baruch Mr. President! President Trump wouldn’t have been able to make his announcement; indeed Israel would not have sovereignty over the Golan Heights if it weren’t for Eli Cohen, the man known as the greatest spy in Israeli history. Some might even suggest that he was the greatest spy of the 20th century. Even though it was two years before the Six-Day War, more than any single person, Eli Cohen was the hero of Syrian battles of the June 1967 conflict. 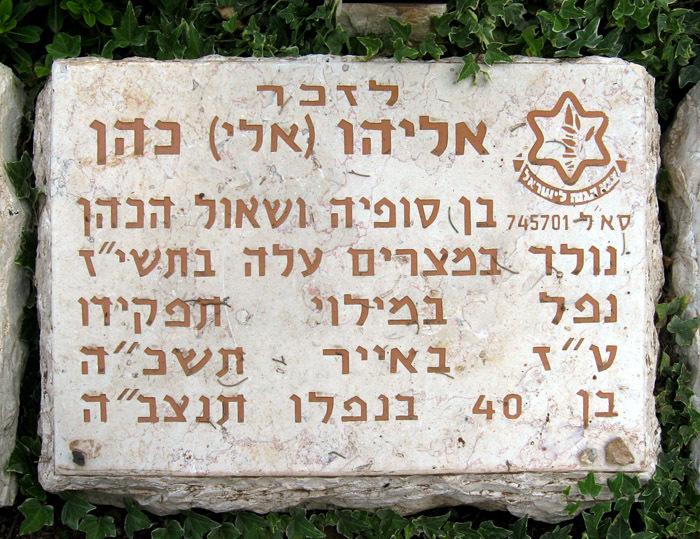 Eliyahu “Eli” Cohen was recruited into Israeli military intelligence in 1960. He was given a false identity as a Syrian Arab who was returning to Syria after living in Argentina. To establish his cover, Cohen moved to Argentina in 1961. Early the following year, Cohen moved to Damascus. He had the foresight to embed himself with the Ba’ath party which he believed would soon rule Syria. They took over the country via a military coup in 1963, and by that time Cohen (who was known in Syria as Kamel Amin Tsa’abe) was entrenched within the social elites of Syria. 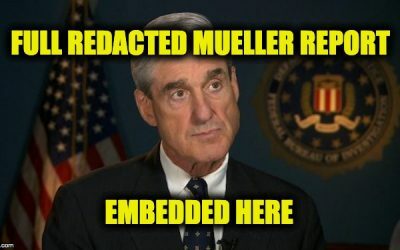 He became a “trusted friend” of the highest-ranking members of the party, while at the same time he used the hidden transmitter in his home to send Israel Syria’s secrets. 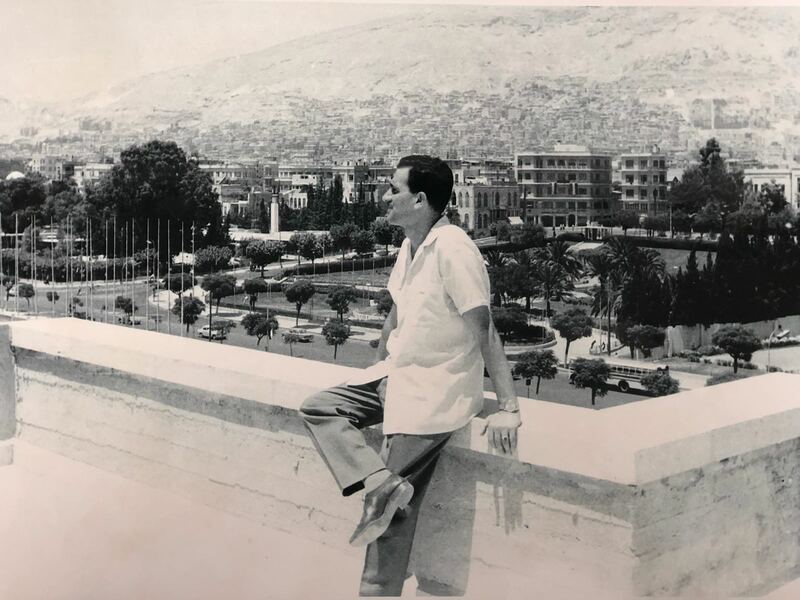 Because of his high position in Syria’s social strata, in 1963 He was invited to discussions regarding Syria’s intentions to divert water from the headwaters of the Jordan River. That would have cut off one of Israel’s major freshwater supplies. Cohen transmitted the diversion plan back to Israel the IAF was able to effectively destroy the Syrian attempt. Note: for those of you who have never been to Israel…it’s called the Jordan River…but it’s more like a creek. Cohen’s most significant achievement was to set up the Golan Heights to be conquered by Israel in the Six-Day-War. The Golan Heights is a plateau which overlooked the Syria/Israel border and allowed the Syrian military the high ground to send armaments into the northern Israeli villages. 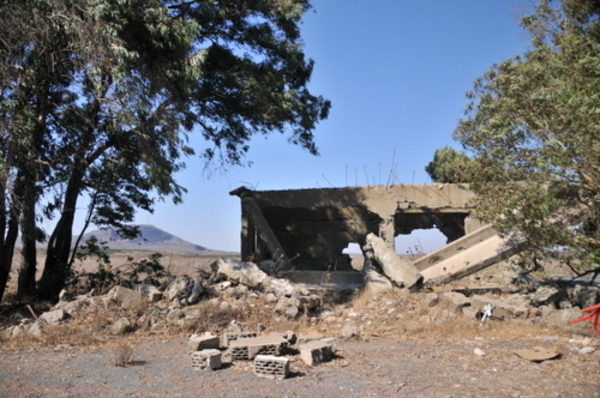 Usually, non-military personnel were not allowed to visit Syria’s Golan Heights fortifications. It was considered a restricted area where only senior members of the Syrian military were allowed to visit. However Eli Cohen was able to not only get a tour of the Golan Heights, but he got a comprehensive military briefing of the strategic area and all its positions. After a showcase trial, he was found guilty of espionage and publicly hanged by Syria on May 18, 1965. To this day Syria refuses to return Eli Cohen’s remains to his family for burial in Israel. Forty-three years have passed since he was executed, but Eli Cohen – “Our Man in Damascus” – is still considered by the defense establishment as the greatest spy in Israeli history. On Monday, The Jerusalem Post interviewed the man who for three years received and decoded the transmissions Cohen sent back to Israel from deep inside Syria. Cohen operated behind enemy lines – establishing close ties with the top Syrian political and military leadership – from 1962 until he was hanged almost exactly 43 years ago on May 18, 1965. 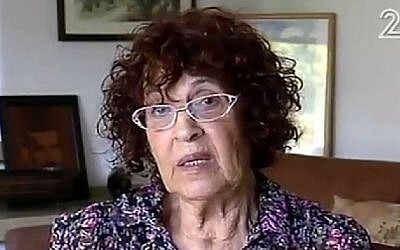 “A,” today a 62-year-old veteran of the Israeli intelligence community, was a 20-year-old radio operator with Military Intelligence (MI) when in 1962 he began receiving the daily radio transmissions from Damascus. According to “A,” Cohen used to send daily messages always at the same time of the day – 8:30 a.m. Cohen, who was known in MI by the number 566, wrote in encrypted French and sent his messages via a tiny radio transmitter. With that message, Israel’s leaders knew what Eli Cohen was about to face. 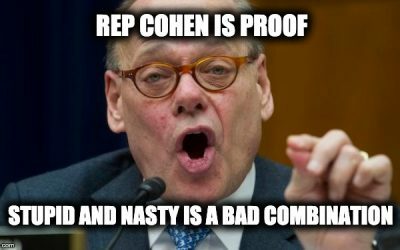 Cohen was tortured and convicted by a military tribunal which had denied him a lawyer. 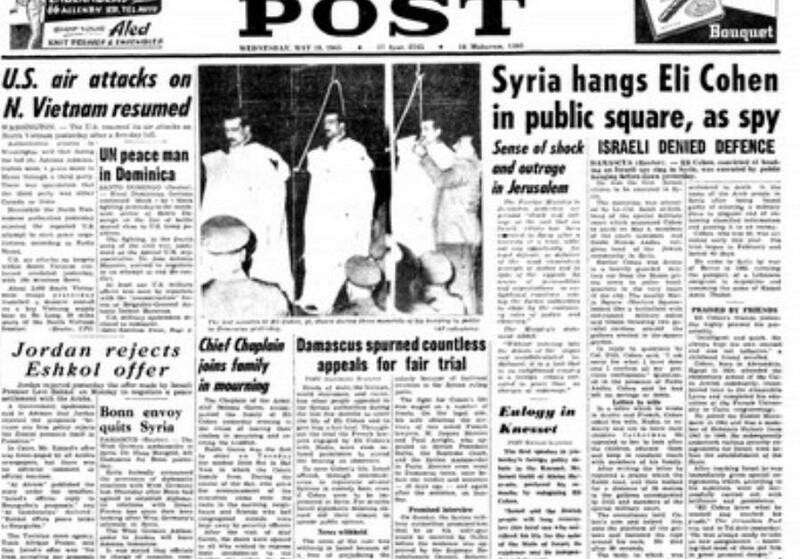 Despite many appeals, including from Pope Paul VI and the governments of France, Belgium, and Canada, the Syrian government refused to commute the death sentence, Eli Cohen was executed in Martyrs’ Square, Damascus, in May 1965 before some 10,000 spectators and a TV audience. Although the Six-Day-War wouldn’t happen for another two years, Eli Cohen was one of the keys to Israel’s victory over Syria in 1967. 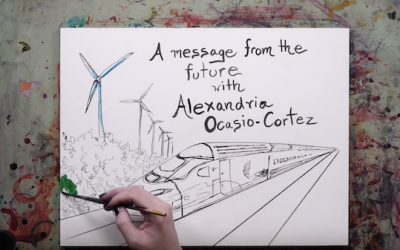 There is no question that the intelligence that he sent was instrumental in allowing Israel to quickly and effectively defeat the Syrians and gain the Golan Heights. All they had to do was target the trees. If it weren’t for Eli Cohen, most probably President Trump would not have been able to recognize Israel’s sovereignty over the Golan Heights, because that sovereignty might not exist. May God protect the soul of Eliyahu Cohen and may his memory always be for a blessing, he was a true hero.